Hang Glide Chicago is your midwest flight school, offering a variety of introductory and advanced training to fit every level and every need. Interested in experiencing your first flight and learning if hang gliding is for you, Try our discovery tandem packages. Business Outings, Bachelor/ Bachelorette Parties, Birthday Parties - Make it original and unforgettable. 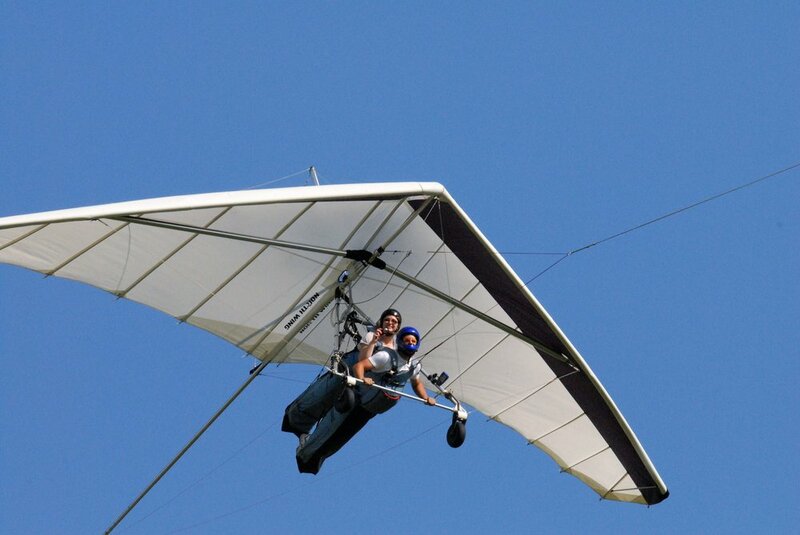 Hang Glide Chicago offers Introductory and Advanced Flight Training. Learn how to get your ratings to fly solo. Enjoy Field Airpark and Campgrounds is your destination for relaxation, excitement, and entertainment in the heart of the Midwest. With facilities and amenities to match our hospitality, whether you prefer a bunkhouse or tent camping, you can unwind comfortably. Come to Enjoy to experience the thrill of flying and stay for fun of it. We hold special events throughout the year, and everyday offer catch and release fishing, swimming, water sports, bags games, bonfires, stargazing, and BBQs. What more could you want? Enjoy Field offers daily camping and bunkhouse rentals, with full shower and bathroom facilities, kitchen, BBQ, and bonfire area. This is your ticket to a great weekend getaway. All certificated pilots are welcome to fly at Enjoy! We offer licensed pilots great rates on tows. Do you have what it takes to become a solo pilot? Comprehensive flight training is available. Looking for advanced ratings, special endorsements or clinics to hone your skills? Find the information you need to prepare to fly, including LZ information and useful links. 3236 N. 700 East Rd.